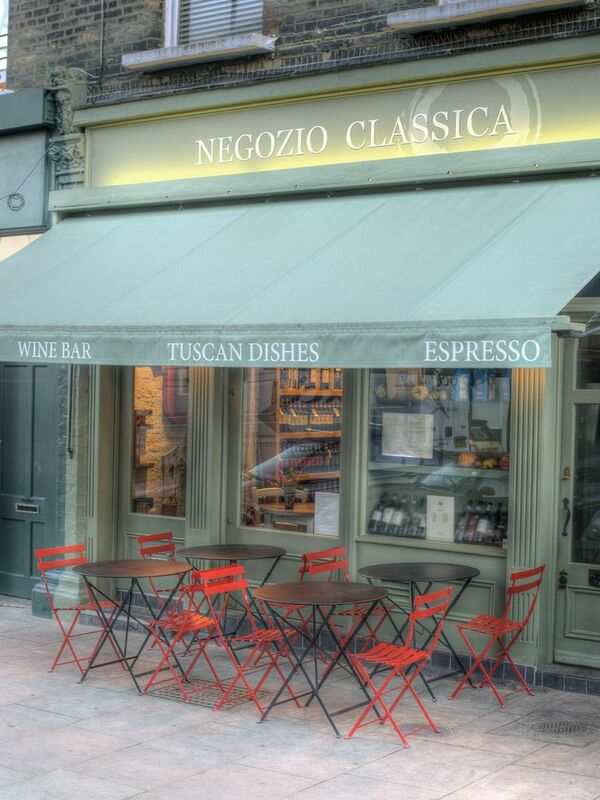 Walking along Regent’s Park Road near Chalk Farm, with it’s myriad of cute little shops, there sits a charming Italian enoteca, Negozio Classica. 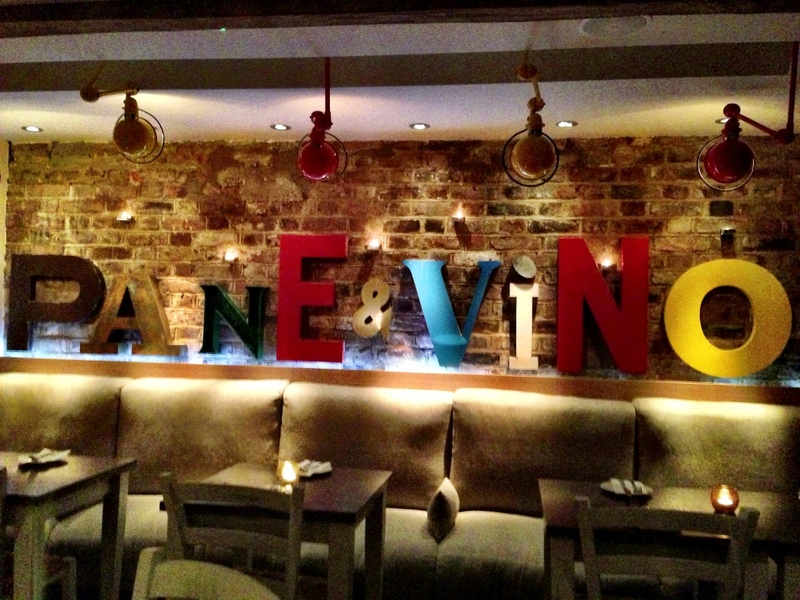 A North London outpost of it’s Notting Hill namesake, Negozio is owned by the Italian winery Avignonesi and specializes in not only importing their wines but also wines from other boutique producers. As a matter of fact, they boast a wine list from which fully 60% of all the wines are only available by them here in the UK. 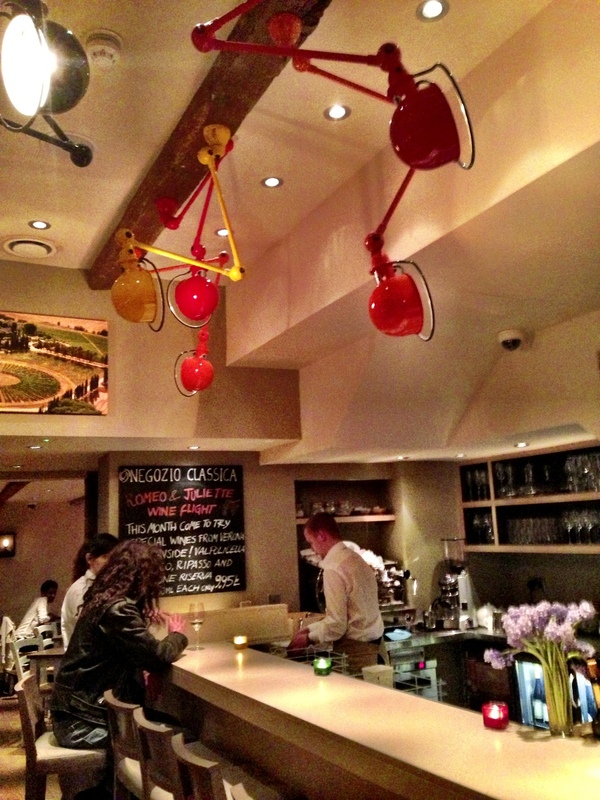 I was invited by Negozio to not only try the wines but also the food to go along with it. 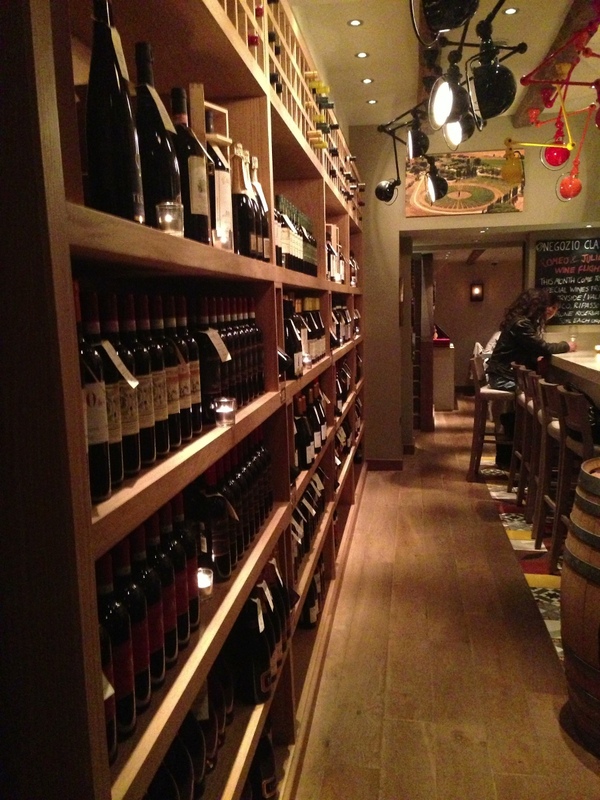 Entering the place, the walls are lined with bottles, all of which you are offered at retail prices to take home. For a corkage fee of £8.50, you also have the option of having the wine there at one of the tables near the windows or at the short bar that leads into small back dining room in the back of the restaurant. There is also a larger dining room upstairs. 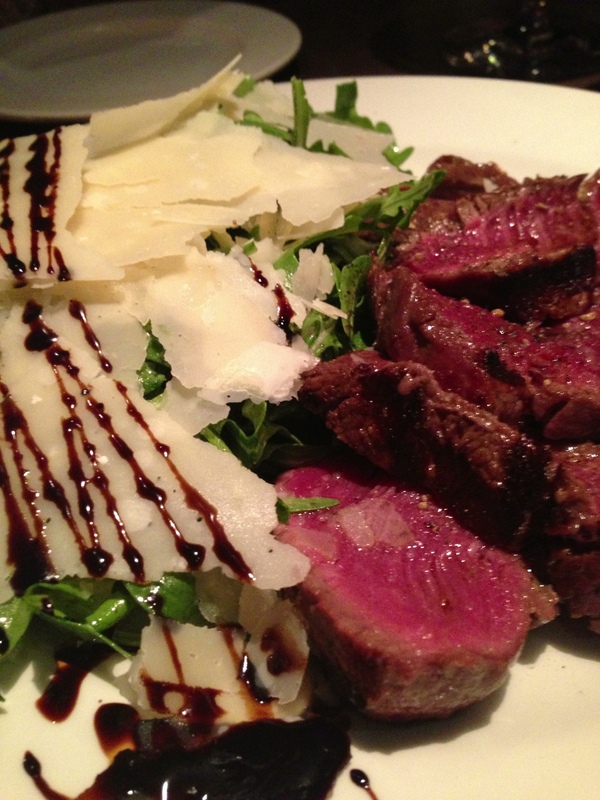 The restaurant specializes in Italian cuisine, naturally, with a selection of Italian bistro fair (antipasti, salads, meats) as well as traditional Tuscan pasta specialities. 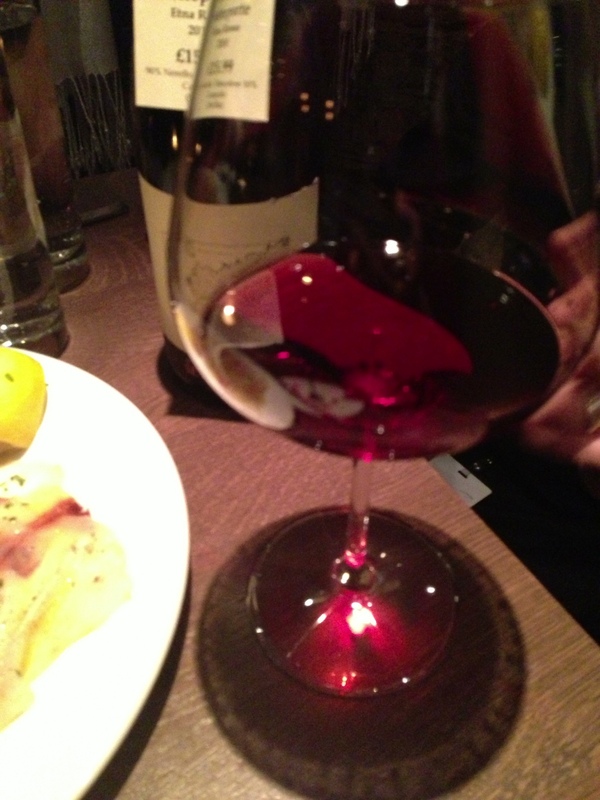 The evening I went, I had a few dishes paired with the house wines. As they have Enomatic machines, the wines are always fresh and always available. A starter of mozzarella, avocado, tomato salad was deliciously fresh- the tomatoes juicy and tasty and the mozzarella, creamy with just the right denseness to it. And, the avocado was perfectly ripe! Often times, I find when I order this salad the avocado is disappointingly hard and watery. A peachy, fleshy, fruity vermentino (2012) produced by Fattoria Sardi (Toscana) was a good choice for this light salad. One of my favourite dishes was the smoked swordfish carpaccio – intensely smoky, delicately fishy (in a good way) paired with an Etna Rosso, the Masseria Ceteporte 2010, was 100% Nerello Mascalese and reflected its volcanic roots with a smoke tinged, red cherry accented wine, an excellent palate cleanser. As we were in a Avignonese owned restaurant, we had to give them a try. The Desiderio is one of their flagship wines and what a Supertuscan it is! The 2008 is 85% merlot and 15% cabernet sauvignon, a velvety, full bodied wine with an aromatic nose emanating from the glass, a real treat and paired with perfectly cooked medium rare steak with a salad of rocket and parmesan cheese, an umami explosion. I’d go back just for that combination. 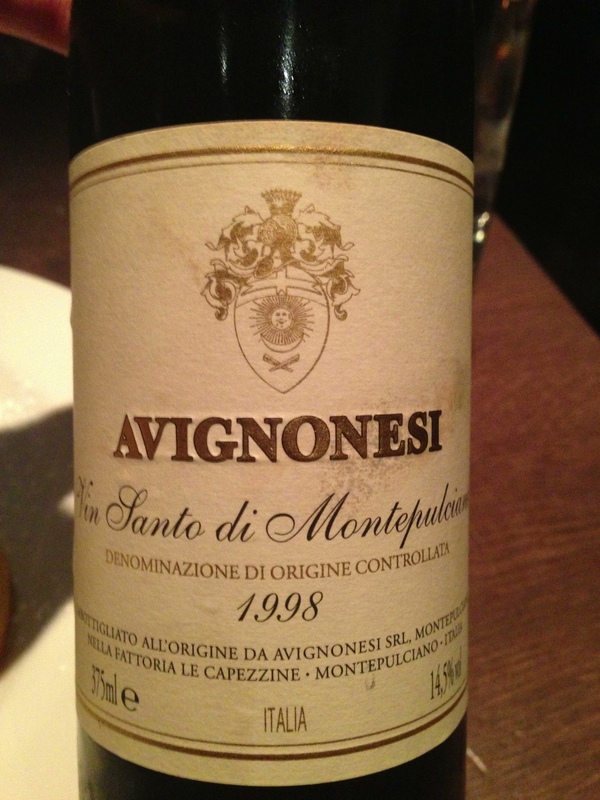 Avignonese makes a legendary Vin Santo and the restaurant has a 1998 available at the moment. The wine is left in barrel for 10 years, bottled and then held for another year before being released. This wine will last a year after opening but why you would want to keep it open for so long is a mystery to me. 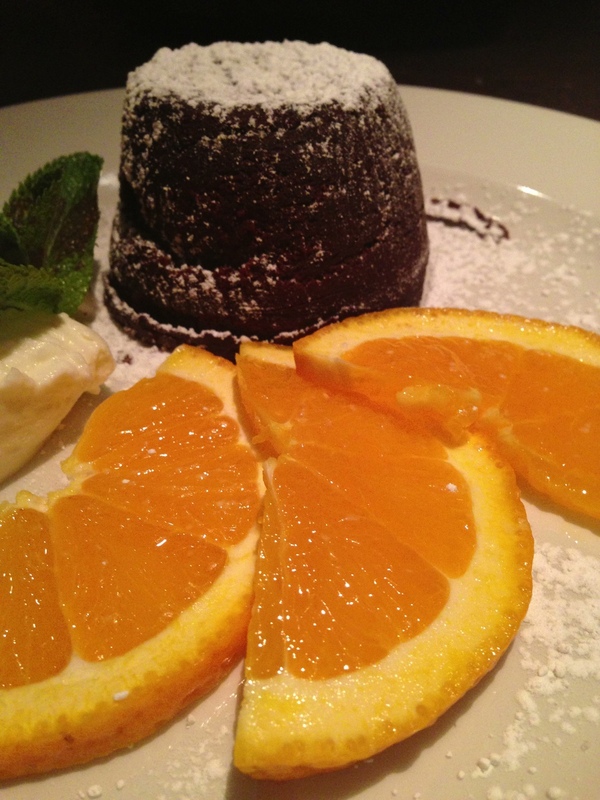 I was advised to only smell the wine as I was eating my chocolate fondant and drink it afterwards. Strange but I was game and did as I was told. And was I glad I did. It has an deep nose, full of dried figs, prunes, roasted nuts and a hint of orange. On the palate it is rich and decadent. It reminded me of PX, having an almost viscous quality to it but fortunately still have a line of acidity running through it. I only had 25 mls of this but that is enough to satisfy even the most die hard Vin Santo fan. If you’d like to do some Italian wine exploring yourself, Negozio has a Wine Flight of the Month on the menu, offers a wine Happy Hour M-F from 5pm – 7pm and in their Notting Hill branch they have Monday Night Masterclasses where you can learn with their sommelier to guide you.